It’s like a cheerleader. Beautiful but dumb, and not particularly necessary. 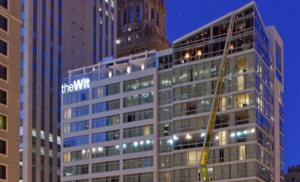 I was at The Wit Hotel in Chicago last week, and it’s a nicely and recently remodeled hotel with some nice assets, but many more serious flaws. The Wit is a singles scene. They have a wonderful rooftop bar that the locals of Chicago (rightly) want to spend a lot of time in, but that means that as a hotel guest you won’t get good service. In fact, it’s unlikely that you’ll even score a table without a reservation. I was there as part of a Kenmore group, and we did have a table, and some delicious food, but cocktails are served in plastic glasses, which means you will have lukewarm wine. Not a deal breaker, but also not exciting. My first night at The Wit was horrible. Not sort of bad, but absolutely dreadful. With the air conditioning blasting full force, the room remained over 70 degrees. At 2am I called the front desk. No one answered the phone. At 3am I called the front desk. Still no answer. At 8am when I had to get up for the drive out to Sears I wanted to put the hotel manager’s head on a stick. When I stopped by the front desk and explained that there hadn’t been any air conditioning on a 92 degree day with ridiculous humidity no one was surprised. You see the building is an old building and in an attempt to be energy efficient they shut off sections of the building’s air conditioning at night. They had no explanation as to why the front desk didn’t answer the telephone. The staff was lovely and appropriately apologetic. The left a plate of lollipops and fruit in the room after engineering fixed the problem. Sadly, my friend Ciaran had no air conditioning in her room on our second night. As much as I appreciate the clean rooms, and hipster vibe of The Wit, I’d caution anyone from actually spending a night there, because when push comes to shove, a hotel room that you can’t sleep in is worse than a tent. I would decline a free night at The Wit. It was that bad. This is my biggest hotel peeve: hotels that put other visitors (restaurant, bar, special event, etc) above their actual guests. I once stayed at a hotel in Nashville during prom season and had high school kids blasting music, running up and down halls, and stopping the elevators all night long. The front desk literally shrugged their shoulders when I asked if they could at least get the noise under control. If it weren’t for the fact that I found mild amusement in hideous dresses worn by Southern prom queens, I would say it was my worst hotel visit ever. Out of curiosity, did you choose the hotel or was it part of the Kenmore package and thus chosen by them? I did not choose the hotel. I hate sounding ungrateful, but I’d hate even more for folks to mistakenly end up there. There is no excuse for no ac, especially when a place is supposedly remodeled and “hip.” I’ve been to Chicago lots of times and there’s plenty of great hotels that provide ac 24/7. Trust me, the Wit is one place I won’t be staying. I actually had one incident when I came out of the shower and my room was boiling, but it then went cold again shortly after. Oh, and I did wake up sweating on my last night there but again, I turned the ac down and it went back to cool fairly soon. It wasn’t long enough for me to call the front desk. Guess I was lucky. I did have excellent customer service by Charles in room service, he even threw in a free Fiji water for me and read me the menu since mine was missing from my room. Thanks for this review! Sorry you had troubles there, but your insight have steered me towards my first choice of hotel for our mini-getaway (which is NOT this hotel! ).